It’s time to dust off your seat and oil your chain because this Friday, May 15 is the annual F5 Bike to Work Day. Join your fellow PNW two-wheelers and get your morning dose of cardio! Cycling is one of the best forms of exercise because it’s a low impact activity (great for all ages), environmentally friendly and a proven stress reliever. What more could you want? The weather is expected to be partly cloudy with a high of 70°. So no more excuses! 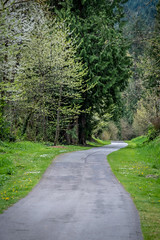 King County Parks invites you to pull out your beach cruiser, unicycle or standard road bike and come visit us on the Burke Gilman Trail at Log Boom Park. From 7:00am- 9:00am we will be handing out King County Parks swag, tire patch kits, Clif Bars, regional trail maps and some good ol’ high fives .